Well, even though it’s officially now spring, the warm temps haven’t quite caught up yet. I kind of love this “in between” time, though. It’s the perfect time to get inspired for the new season and for me to plan all of the spring recipes I want to share with you. Over on Instagram the other day, I asked for any recipe requests anyone might have for the coming season. Very excited by the responses as many of you want fresh spring salads and entrees, risotto and quiche, dishes using floral ingredients and seasonal produce, and lots of pasta salad! Very on board for all of this, and can’t wait to get creating. 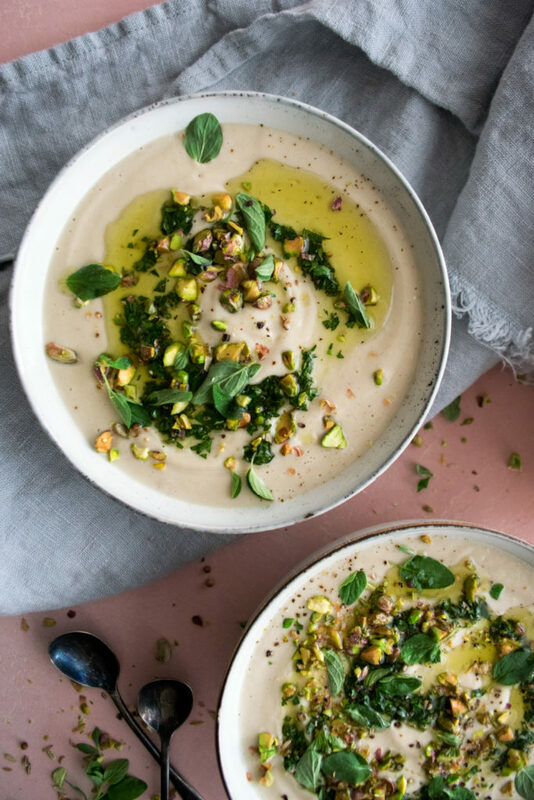 For now, I’ve got this creamy spiced cauliflower soup for you that I really think will become a new favorite. 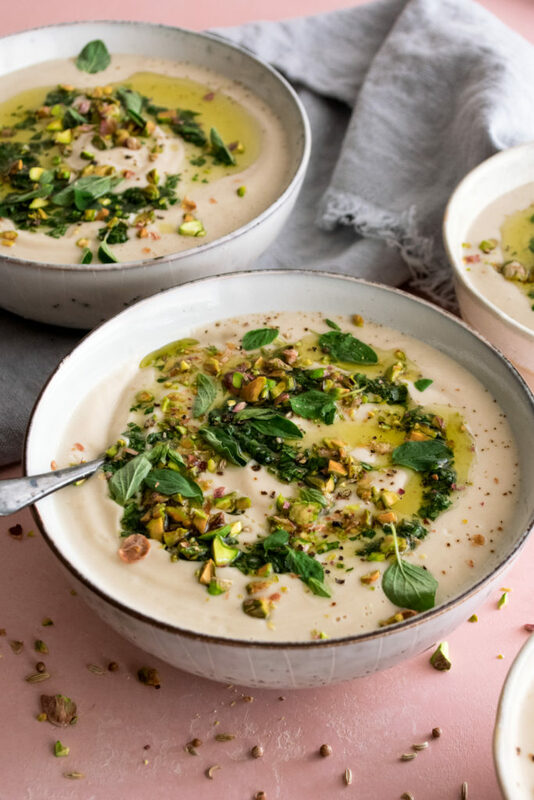 It’s a soup with an incredibly simple method, but gains so much flavor from the toasted spices that it feels extra luxurious. I’m using fennel seed, coriander, cardamom, cloves, and red pepper flakes for lots of depth and warmth. Cauliflower is rather subtle, so I think it can take a lot of spice. 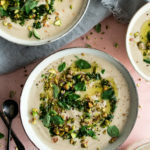 To brighten up the creamy soup, I just drizzle a little chimichurri right over top, along with some chopped pistachios. Chimichurri is the tangy, herby sauce that once you try it, you’ll want to use it everywhere. 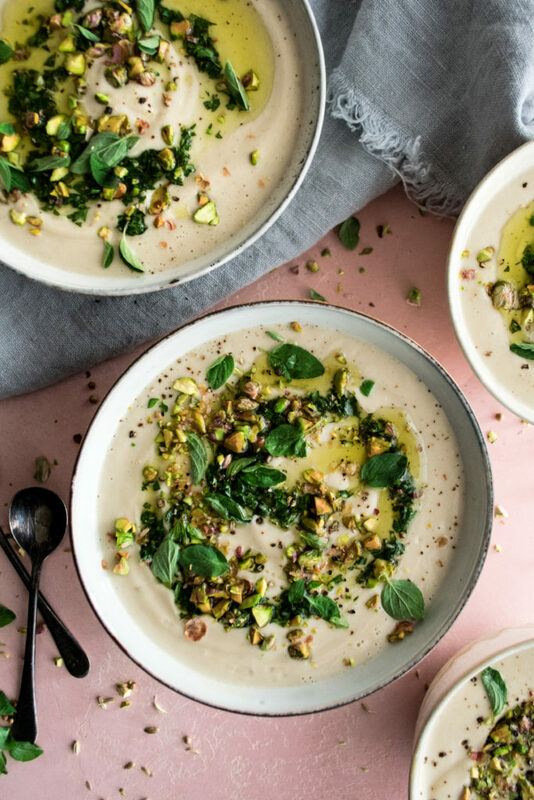 It works so well with meats because it cuts the richness a bit, and that’s exactly what it does with this soup. I took this exact chimichurri recipe and added a few teaspoons of spicy calabrian chiles to it for these sweet potato fritters. Same sort of contrasting concept. Preheat the oven to 375°F. Toss the cauliflower florets with a good coating of olive oil. Spread them out onto a sheet pan and sprinkle with a pinch of salt. Roast for about 30 minutes, or until caramelized. Heat a large, heavy-bottom pot or Dutch oven over medium heat. Add enough olive oil to coat the bottom. Add the onions and a pinch of salt. Let the onions sauté for a few minutes until tender. Add a little bit more olive oil, along with the garlic, coriander, fennel seeds, red pepper flakes, cardamom, and cloves. Let the spices toast in the oil for a minute or so until fragrant. Stir in the chicken stock, heavy cream, thyme, and oregano. Bring the liquid to a boil. Add in the roasted cauliflower, reduce the heat to medium-low, and simmer for about 20 minutes. Remove the herbs. Working in batches, blend the soup for 90 seconds until smooth and creamy. Taste and season with salt as needed. 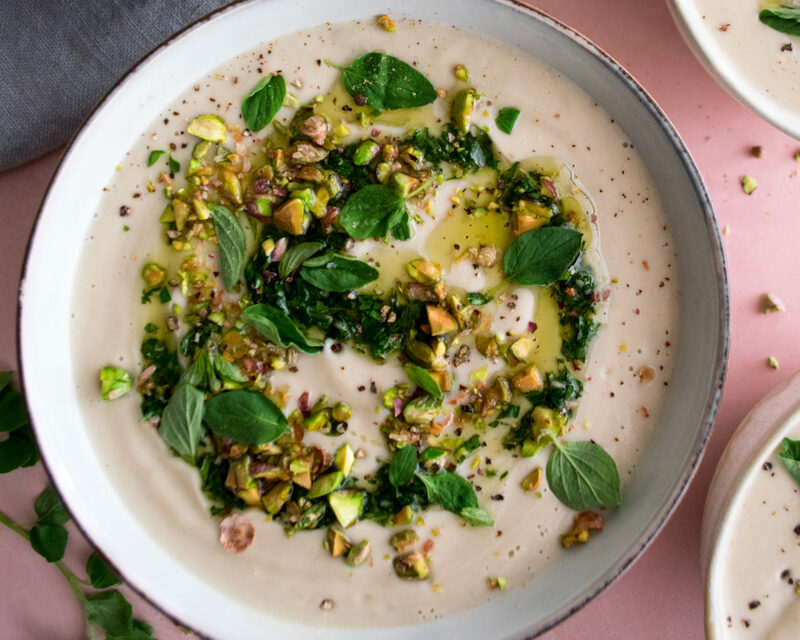 Serve the soup warm with the chimichurri drizzled over top, along with a sprinkling of pistachios. Combine the garlic, parsley, and oregano in a small bowl. Stir in the extra virgin olive oil and red wine vinegar. Season with a pinch of salt. Taste the chimichurri and add more salt or vinegar if desired.